A response to the debate on abolition in Jacobin Magazine. The weekend of August 19 2017, amid the second nationwide inside/outside mass protest against prison slavery in as many years, Jacobin Magazine published an article against prison abolition entitled How to End Mass Incarceration by Roger Lancaster. Lancaster argued that returning to an ideal of puritan discipline and rehabilitation is more realistic than pursuing the abolition of prison entirely. Santa Cruz Town Clock— On January 16, community members representing Santa Cruz County came together to voice opposition to California’s plans to pour another $500 million into jail construction (SB1022). The same day, the Board of State and Community Corrections met to confirm which counties will be awarded SB 1022 funds to build new jail facilities—whether it be for program space or new beds. An internal Executive Steering Committee (ESC) has recommended 15 counties to receive as much as $80 mill to support their projects. BSCC granted Santa Cruz County $25 million to expand and reopen unused facilities at Rountree Detention Center in Watsonville. Community members in Santa Cruz gathered at the Town Clock on January 16 to tell the county Board of Supervisors to “invest in communities, not cages” and to reject the large grant awarded by the state for jail expansion, whether it be for program space or new beds. This fight ain’t over yet! Our Sheriff and Board of Supervisors have 90 days from last Thursday to accept or reject the grant, which means: we can still stop this! We are drafting letters to our Board of Supervisors for organizations and individuals to sign onto; building coalitions in Watsonville; organizing a mobilization to the Board Of Supes meeting; and gathering weekly to come up with a creative game plan for some grassroots political pressure. You with me? Download The Realignment Crisis as pdf. California’s prisons are overcrowded. So overcrowded that in 2011, the US Supreme Court ordered the state of California to reduce its prison population by 10,000 inmates. 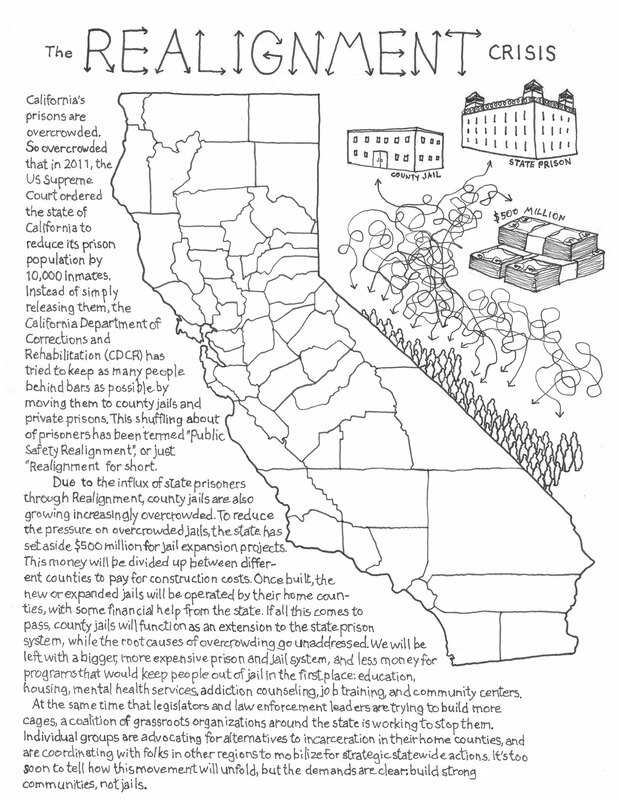 Instead of simply releasing them, the California Department of Corrections and Rehabilitation (CDCR) has tried to keep as many people behind bars as possible by moving them to county jails and private prisons. This shuffling about of prisoners has been termed “Public Safety Realignment”, or just “Realignment” for short. As a result of the influx of state prisoners through Realignment, county jails are also growing increasingly overcrowded. To reduce the pressure on overcrowded jails, the state has set aside $500 million for jail expansion projects. This money will be divided up between different counties to pay for construction costs. Once built, the new or expanded jails will be operated by their home counties, with some financial help from the state. If all this comes to pass, county jails will function as an extension to the state prison system, while the root causes of overcrowding go unaddressed. We will be left with a bigger, more expensive prison and jail system, and less money for programs that would keep people out of jail in the first place: education, housing, mental health services, addiction counseling, job training, and community centers. At the same time that legislators and law enforcement leaders are trying to build more cages, a coalition of grassroots organizations around the state is working to stop them. Individual groups are advocating for alternatives to incarceration in their host counties, and are coordinating with folks in other regions to mobilize for strategic statewide actions. It’s too soon to tell how this movement will unfold, but the demands are clear: build strong communities, not jails. This letter is sent to you on behalf of Sin Barras, a local grassroots group dedicated to prison abolition and alternatives to incarceration. We support the Sheriff’s goals of reducing overcrowding and making constructive programs available to those in need, but believe that the proposed jail expansion cannot guarantee achievement of those goals. Claims that the new facility would reduce overcrowding and free up programming space at the Main Jail are predicated on assumptions of the jail population remaining stable well into the future. According to the proposal, 64 new beds at the Rountree facility would allow for the removal of temporary beds that now fill the Main Jail’s “day areas,” making programming once again possible in those spaces. But if there is another increase in the number of state prisoners sent to to the county jail, if there is an influx of local offenders, or if the jail population increases for any other reason, there is nothing to stop temporary beds from once again pushing programs out of the “day areas.” When this comes to pass, we will be left with a larger, but still overcrowded and still program-deficient jail. The last two decades of prison expansion in California show that adding more beds does not reduce overcrowding; that we are in this situation now is a testament to that fact. When we build beds, we eventually fill them, and then some.